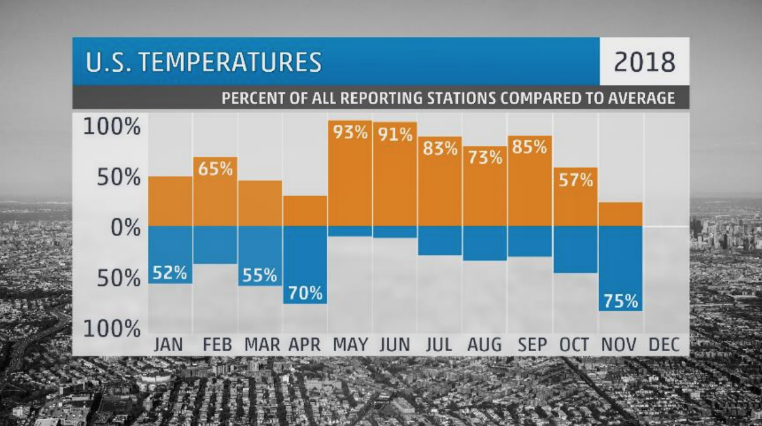 Here’s a little spoiler to start us off: there wasn’t much warmth anywhere in the U.S. this month. Look at our warmest spot in the country as an example. 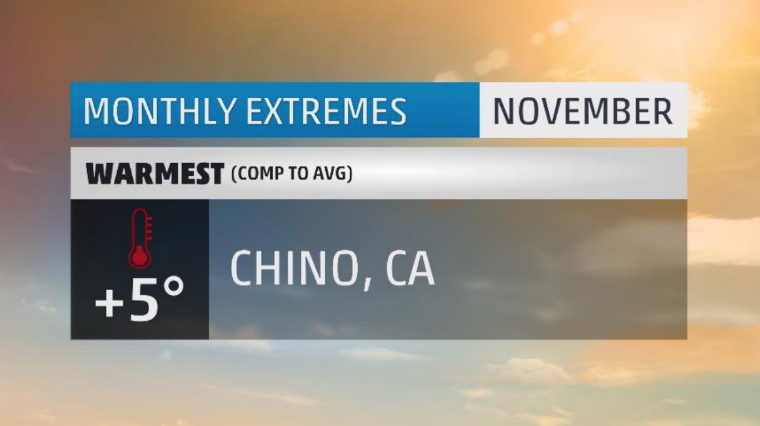 Chino, California saw their 4th warmest November on record at just 5 degrees above average. Twenty-eight days of the month had above average temperatures but all were under a ten degree anomaly. They did manage to see three straight 90- degree days but that only result in their 14th warmest November heatwave and the 7th highest number of 90 degree days. Twenty days saw highs above 78 degrees which is the most for any November; however, no record high temperatures were set or broken. November would end with Chino having its 4th warmest fall on record (September-November) and they are currently on pace to have their 2nd warmest year. Instead, a lot of the country was cold this November; and stinkin’ cold at that! Take our coldest spot in the country for instance where they not only had their coldest November on record, but ended the month at an impressive eleven degrees below average. Say hello to Sedalia, Missouri. Sedalians witnessed 27 days with below average temperatures including 15 that were at least 10 degrees below average, 7 that were at least 20 degrees below average, and one day managed to be an impressive 30 degrees below average. There were 22 days where temperatures failed to reach 50 degrees which is tied for most in any November. Two of those days saw highs only reach 23 and 24 degrees respectively. Those both set the record for first and second coldest November day on record. Seventeen lows were at or below the freezing mark which is the 3rd highest for any November on record. But the coldest stat of them all would be the two nights where the mercury dipping down to nine degrees. That nine degree reading would break the all-time November record for coldest temperature. In all, Sedalia would set 5 new cold high temperature records and another 10 record lows making for quite a month of shattering records. November also ended their 2nd coldest fall. Snow accompanied this cold air with just under a half foot falling during the month. 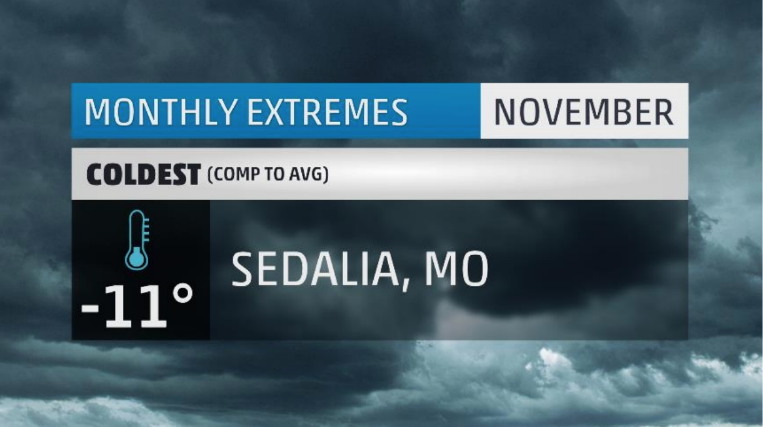 Sedalia is currently on pace to have their 9th coldest year on record. Brrr! Look at the sea of blue dots across the country! 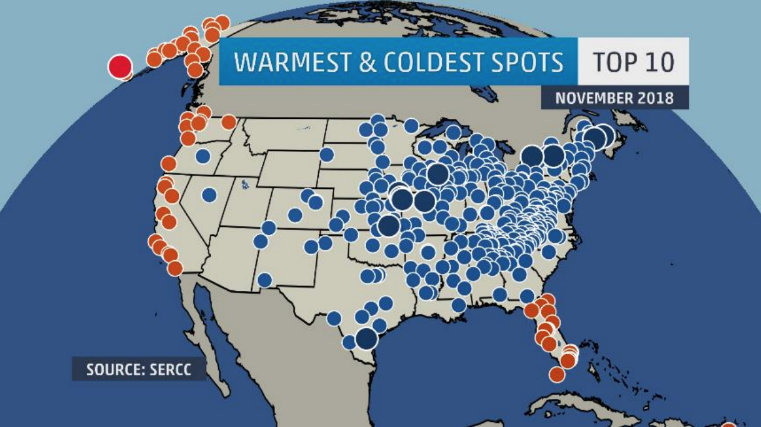 Those blue dots represent cities that saw one of their top 10 coldest Novembers on record this past month. By the way, there are 358 blue dots on that map. Compare that to just 65 locales that had a top ten warmest November on record. As a whole, the U.S. had its 27th coldest November on record making it the first time since April of this year that we ended a monthly on the colder side of average. Five states would have a top ten coldest November including Missouri (4th), Arkansas (7th), and Oklahoma (9th). The only outlier would be California which had its 9th warmest November on record and is the only state to crack the top ten this month. 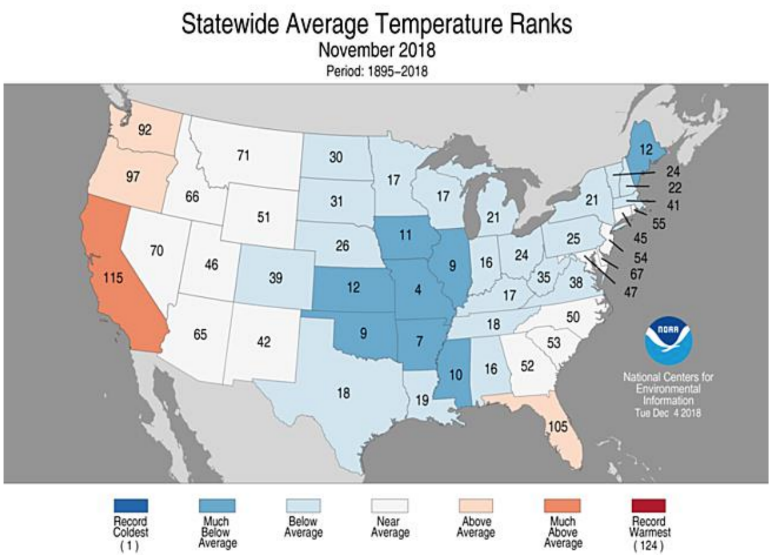 Seventy-five percent of all weather observation stations across the U.S. reported below average temperatures during November. This marks the first time since April that we’ve seen a majority of the country below average and the greatest cold departure from average all year. 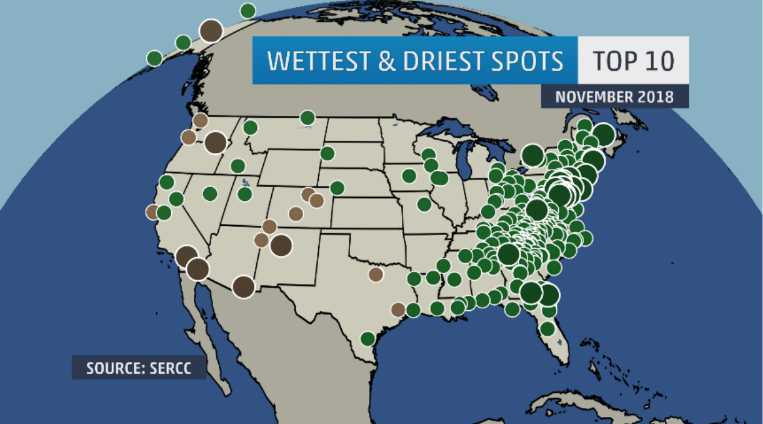 It was a very wet November across much of the U.S. (more on that later) but our wettest spot in the country returns to a perennial favorite and frequent winner of our top wet spot. It’s been since the beginning of this year that we’ve seen Quillayute make the grade as wettest place in the country, and perhaps for no surprise. What is usually one of the wettest places in the world is currently was just in a major drought just a few months ago. If the year ended today, Quillayute would have had its 6th driest year on record. November was able to turn the ship a bit with just over 16 inches of rain. While that would only qualify as their 18th wettest November on record, they did see a month that was marred with steady, soaking rains. There would be twenty-one days with measurable rainfall including one day that saw over four inches fall. This concluded their 15th driest fall on record, just going to show how incredibly dry September and October were over the area. It was incredibly wet from Louisiana to Maine where over 330 cities would have one of their top 10 wettest Novembers on record. Washington, DC, Baltimore, Atlantic City, and Harrisburg all had their wettest November on record! 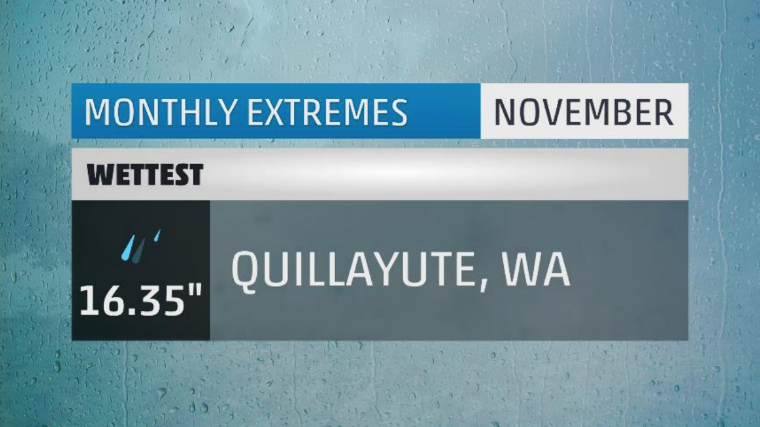 Washington State would see its 2nd wettest November on record, which just so happens to be the home of Quillayute. 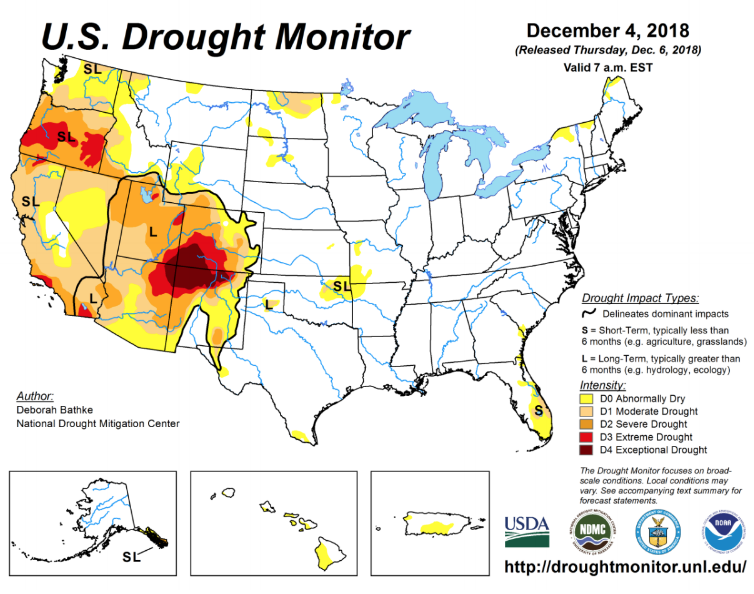 Widespread drought remains across a good chunk of the West. The biggest improvement over the past month came out of Washington State and along the Sierra-Nevada mountains in California. A final shout out to hurricane season 2018 which officially ended on November 30th. The season saw a number of memorable storms including Florence and Michael which were devastating to parts of the Carolinas and Gulf Coast. 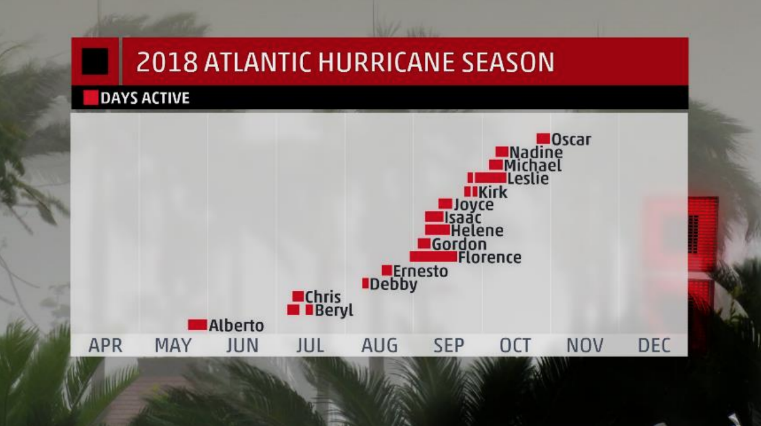 In all, the season would end up above average with 15 named storms, eight hurricanes and two major hurricanes resulting in $33 billion dollars in damages and claiming the lives of over 150 people. Michael would end up being the strongest storm of the season with winds of 155 MPH at its peak and a minimum central pressure of 919mb. Florence would be the longest named storm of the season surviving a total of 18 days straight. 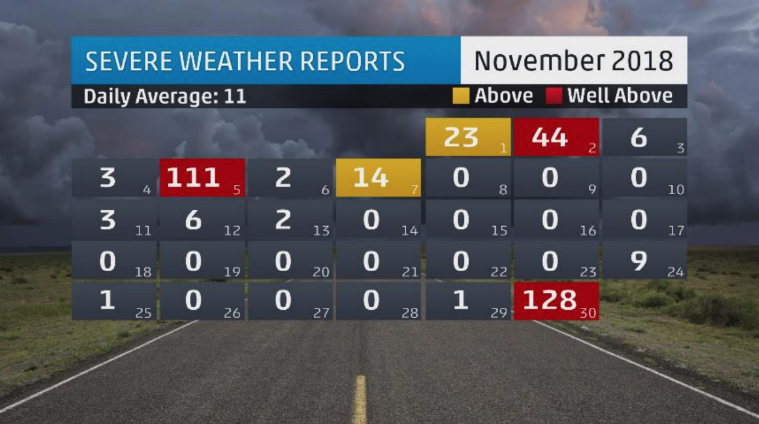 November was another active month in what is commonly referred to as the second severe season. Two days in particular stand out. The first was on November 5th as a severe weather outbreak tore across the Mid-South. Six tornadoes and over 100 reports of damaging winds were the result of potent upper level system and associated cold front that struck during the early morning hours. The second event came on the 30th and saw 12 tornadoes hit across parts of Oklahoma, Arkansas and Missouri. Because of these two events, November would end up above average in terms of tornado and damaging wind reports. 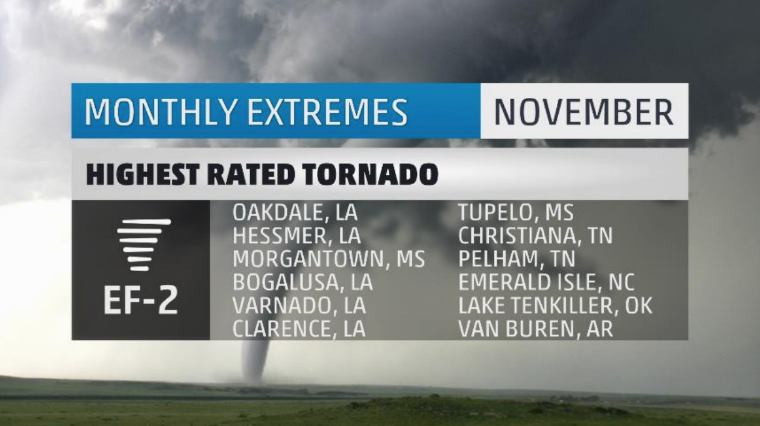 November’s 58 tornadoes makes for the third month in a row with above average tornado counts. 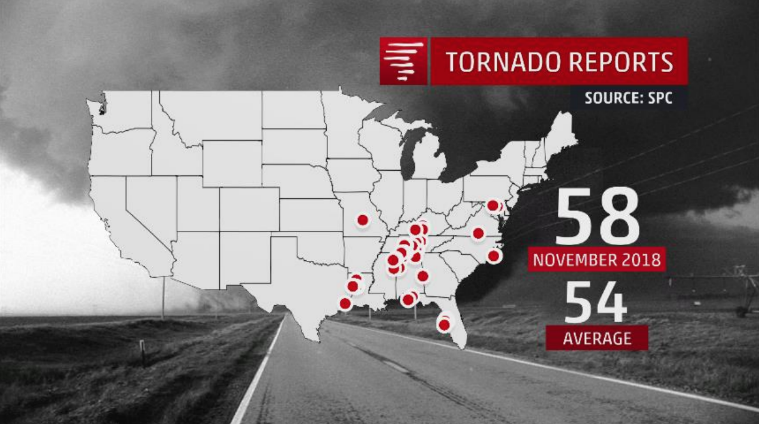 Twelve EF-2 rated tornadoes would touchdown in six different states during November. 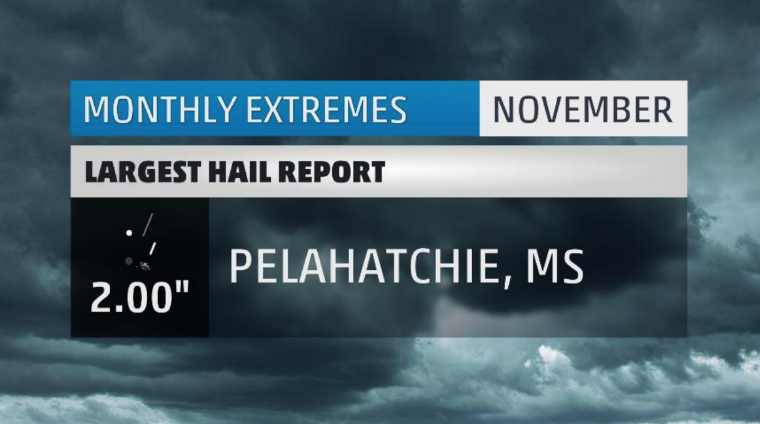 The largest hail stone fell in Pelahatchie, Mississippi and was the size of a billiard ball. 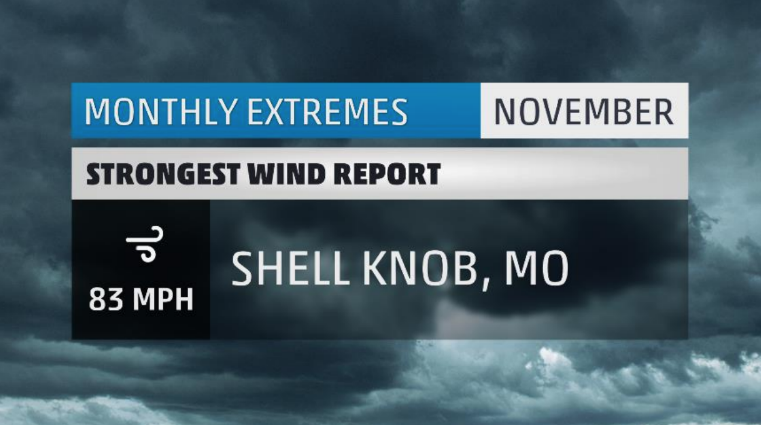 An 83 MPH wind was clocked in Shell Knob, Missouri as a severe thunderstorm raged over the area. 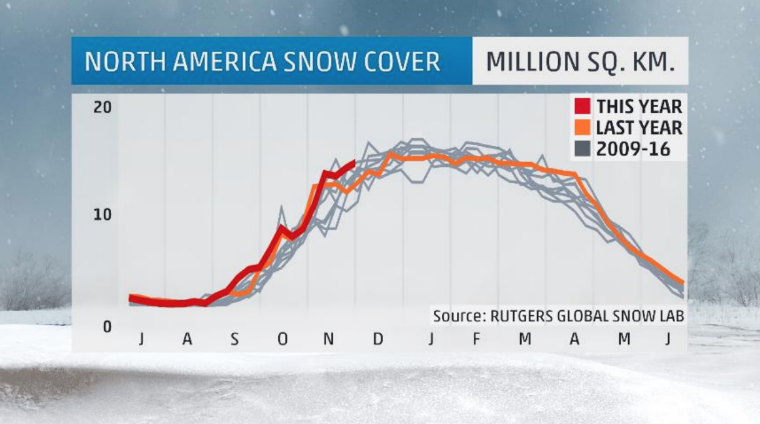 This month’s snowiest city received almost 4.5 times what last month’s snowiest city did. 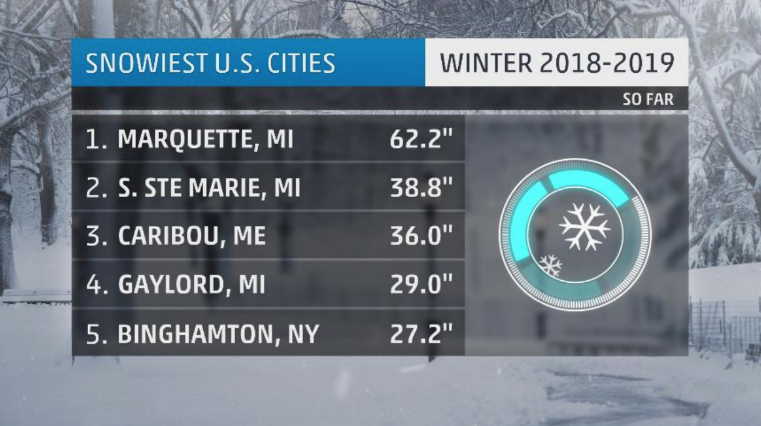 Congratulations to Marquette, Michigan – our snowiest city this November! 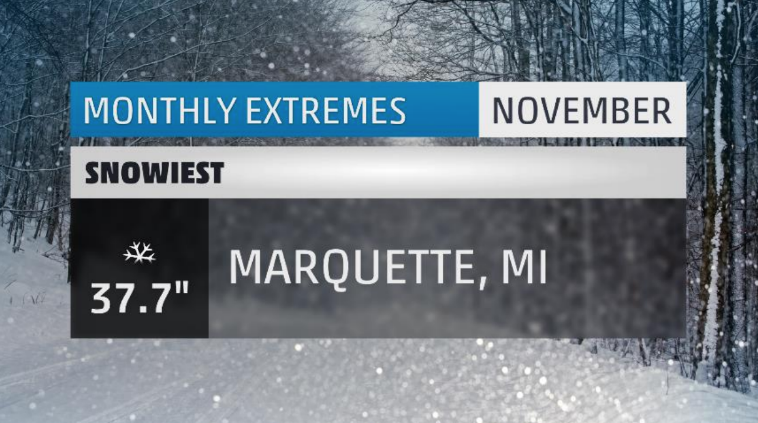 Marquette’s 37.7 inches of snow makes for just their 12th snowiest November on record. They saw a ridiculous 21 days with measurable snowfall which is tied for 2nd most in any November. Marquette did see snow from our first two named winter storms of the season, Avery and Bruce, but the bulk of their snow came from unnamed systems. Beyond the snow, it was downright cold. Marquette had its 3rd coldest November on record including 20 sub-freezing high temperatures. That’s the 2nd most for any November. November wrapped up their 3rd coldest fall and they are currently on pace to have their 22nd coldest year on record. 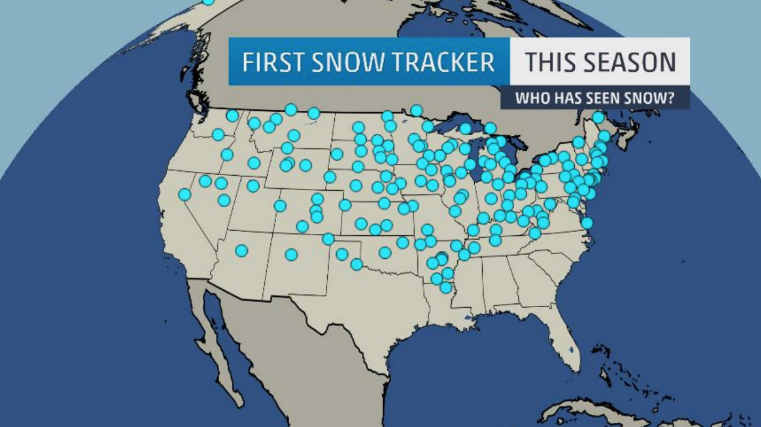 November certainly helped expand our snowy footprint across the country. With the exception of the Deep South and most of Texas, snow has penetrated the majority of the nation so far in this early winter season. A wider view shows that we are above average in terms of snow extent, and well above last year’s mark to date. What effect will this have on the remainder of the winter season? Only time will tell! Another congratulation goes to Marquette for being the snowiest place in the entire country so far this winter season. They are well ahead of second place Sault Ste. Marie, Michigan by about two feet. Michigan does hold three of the top five spots so far. We’ll see how long this lasts. Our sunniest spot in smack dab in the middle of the Sonoran Desert in typically sunny south California. With 29 perfectly sunny days, Blythe, California is this month’s sunniest city in the country. With all the sun, it’s easy to see why they managed exactly zero inches of rain in the month which surprisingly enough is a quarter inch below average. 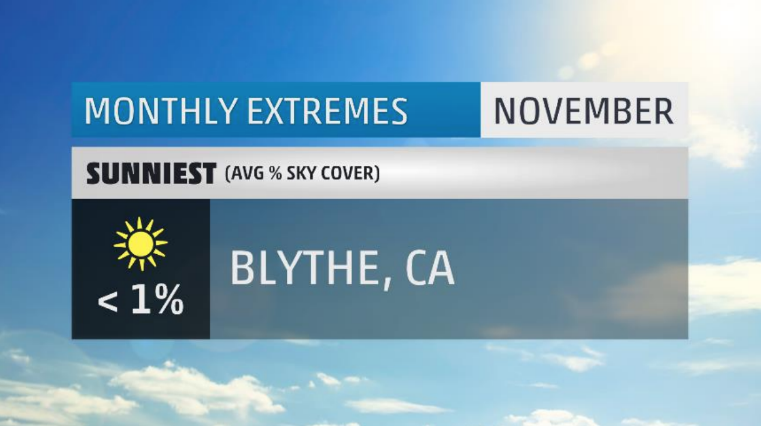 November is climatologically Blythe’s sunniest month of the year. You did it, guys! Oh bother. And then there’s Cleveland. Poor Cleveland. The rock and roll capital of the world had 20 completely overcast days to fill up their November. Twenty-five total days would be considered mostly cloudy or worse, and their best day was only partly sunny at best. There was even one seven day stretch where the skies were overcast 100% of the time. 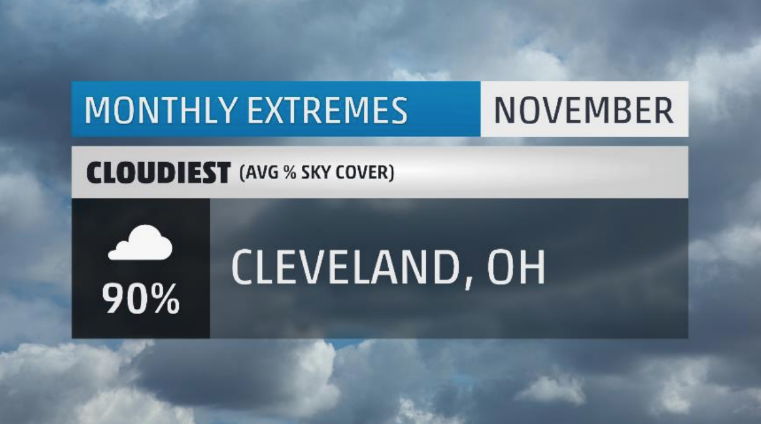 The clouds were accompanied by 16 days of measurable rain making for Cleveland’s 8th wettest November. There were even eight days of measurable snowfall. Cleveland is typically the nation’s 7th cloudiest city overall and their cloudiest month is January. There you have it, the extremes for the month that was November 2018. Make sure to check back next month to see what December has in store! What weather extremes did you face in November where you live? Let me know in the comments below. Camden, Maine: November 2018 set all kinds of records for my 19-year period of observation: 34.8 degrees = coldest November on record; 5 degrees = month record low (first time I got single digits in November); 16 degrees = month coldest-high (by 10 degrees! ); 11 days of snow cover was a record for November; November 15th had my earliest high 32- and earliest low 15 or colder. The second half of the month had no highs>45, and a 13-day period had only 2 highs>36. Well, it might not directly be a weather extreme like those listed here, but I lived through the most extreme fire in California history this month. It was a fire storm, so does that count? I say yes, and I think the entire weather community would agree with me!